RULEZZZ GUYS, WE GOT RULES !! Everywhere you go there are rules. And JSC is no different. Aside from the more extensive BSR’s (Basic Safety Requirements), these are just a few simple rules and requests which we insist that everybody complies with. No spectators beyond the beer line, at any time. Only skydivers and pilots are allowed at boarding point. Skydivers with less than 100 jumps and B Licence, may not use a canopy smaller than 170sq. ft.
Only pro rated skydivers and Tandems may land in front of the club. All other jumpers must land in the student landing area with the “pit” as the target area. The next load must kit up and move to boarding point as soon as the previous load takes off…whether there is a refuel or not. All student gear must be packed inside the clubhouse, in the packing area provided. No swooping the lawn area. No alcohol to be consumed when on duty or when jumping. No drinking 8 hours prior to jumping. No drugs of any kind are permitted on JSC premises. Offenders will be ejected from the JSC premises, and may be banned from the club for life. Any club equipment damaged or broken due to negligence, will become payable immediately by the offender. Pay now…fly later. All jumpers must pay prior to jumping. Daily accounts will only be permitted if a valid credit card is handed to the manifest officer. Guests are the responsibility of the member/skydiver with whom they are present at the club. No parking or driving on the lawned area. No parking inside or in front of the hangar. If there is a malfunction on club equipment resulting in a cutaway, it is the responsibility of the jumper concerned to retrieve the equipment (where possible), after landing. No pets allowed. We have a resident Dog Jerry. Get in touch with one of our members and start jumping! 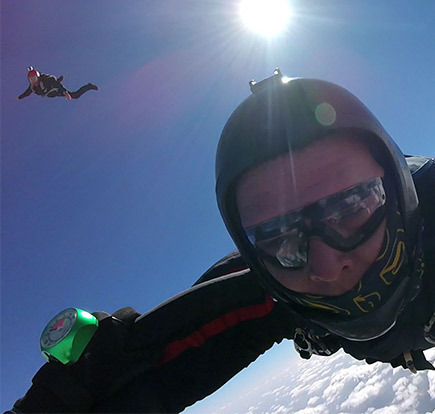 Book a tandem jump or take on one of our skydiving courses today! !